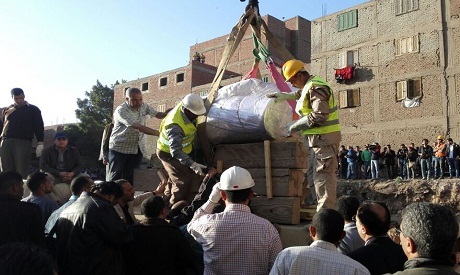 A recently excavated statue of in Matariya in east Cairo arrived early Thursday morning at the Egyptian Museum in downtown Cairo's Tahrir Square. The 3,000-year-old statue was discovered last week by a German-Egyptian archaeological team in the Greater Cairo district of Matariya. Egypt state television broadcasted a live feed of the statue's progression as it was transferred by the armed forces in cooperation with the Ministry of Antiquities after midnight from Matariya district to Tahrir Square. The progression moved very slowly to minimize friction on the body of the statue, given its enormous weight approaching 50.8 tonnes. Other artefacts were transferred along with the body of the statue, including its head which weighs 1.5 tonnes. Minister of Antiquities Khaled El-Enany and Minister of Tourism Yahya Rashed are scheduled to hold a press conference at the Egyptian Museum on the sidelines of the statue's reception later on Thursday. The statue will undergo restoration at the Egyptian Museum and eventually be displayed at the Grand Egyptian Musuem -- a facility under construction near the Giza pyramids which could become the world's largest archaeological museum. The $795 million project, which sits on nearly 120 acres of land approximately two kilometres from the Giza pyramids, is part of a new master plan for the plateau. It is scheduled to open partially in 2018. Ramses II was born in 1303 BC and ruled Egypt for 67 years from 1279 BC until 1212 BC. He ascended to power in his early twenties, and is believed to have died in his early nineties. Ramses was the third Pharaoh of the nineteenth dynasty. His father was King Seti I. Also referred to as Ramses the Great, the pharaoh was one of ancient Egypt's most celebrated rulers, credited with expanding the empire to its greatest historical limits. During his reign, Ramses II led several military expeditions to the Levant and Nubia.